Two days after I previously wrote about the purpose behind everything we do, I sat in a meeting where we discussed the importance of entrepreneurship and job creation. One person suggested that we should not only focus on job creation, but at creating meaningful jobs. 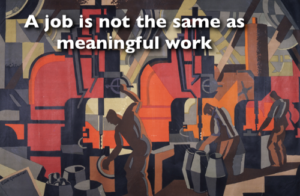 But when exactly is the work that you do meaningful? It seems that when you understand the purpose of what you need to do, that you may experience the work as more meaningful. You may experience a job as meaningless when your personality and skill set does not fit the requirements of the job you hold. For example you are a creative and artistic person, yet you work as a bookkeeper for a company. The compliance standards that you need to adhere to may clash with your more free-spirited approach to life. Sometimes jobs feel meaningless because you need to sell people stuff that aren’t really helping the buyer in any way. But because the job pays, people keep doing it, although it has very little meaning to them. Sometimes people work in such huge companies that they literally never see the end result of the work that they do. They are just one of the gears in a very big machine. This also may lead to a sense of meaninglessness in your work. 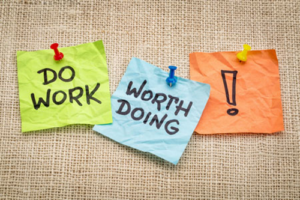 So if you are an employer it will be beneficial to firstly ensure that your employees are a good match for the work they are expected to do according to their real authentic working selves. Secondly, it is beneficial if the company produces meaningful goods and services where employees derive the meaning of their work from the quality and usefulness of what they produce. Thirdly, when an employee may feel that his or her work is only an insignificant part of the final product, it is necessary to tell stories and keep workers informed about what the business is up to. It is vital that people experience the same meaningfulness in their jobs as people working in small enterprises. # Most successful businesses are the result of a business owner’s attempt to solve a problem. Each problem is a business opportunity waiting to be exploited. It is a chance to serve, which is what work really is. To solve a problem for somebody, gives meaning to work. No one can do everything by themselves. Each of us has different skills and abilities therefore we need to serve one another, but on the condition that it isn’t driven by evil motives. 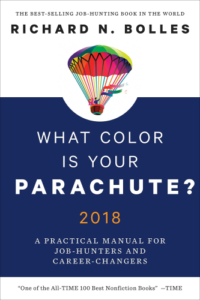 Richard Bolles in What Colour is your Parachute concludes that meaningfulness is closely linked with our mission on earth. Serving each other’s needs with the talents God has given us. To find the best (most meaningful) position, job or business for oneself (or your son / daughter / spouse / employees), one needs to know yourself. A Career Direct Assessment will help you to know and understand your authentic self. I can assure you, it makes all the difference.